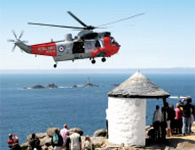 The Land's End Peninsula is one of the most beautiful, naturally wild and unspoilt corners of Cornwall and one of the most important and best loved landmarks in Britain - famous for its unique location and beautiful scenery. 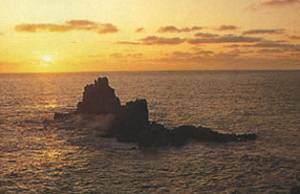 Now, as always through the ages, visitors regard a trip to Land's End as a pilgrimage. You cannot fail to feel a sense of awe and wonder as you stand on the 200 feet high granite rocks that gaze out on the Atlantic and the lost land of Lyonesse. Wherever you go on the Land's End Peninsula, you are never far from the sea. This is a rugged landscaped - wild and beautiful with great views. 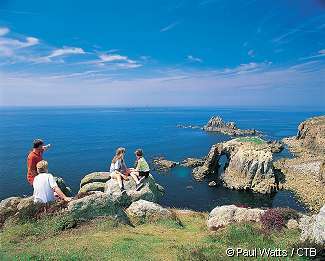 It is rare to discover a place such a concentration of scenery, wildlife, history and arts in such a small area - making Land's End the ideal place for a relaxing family holiday on the beach or as a centre to explore the rugged coast line and moors. 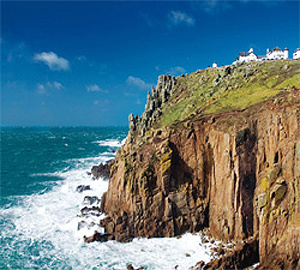 From the awe-inspiring beauty of Porthcurno Cove and the Minack theatre to the remote clifftops of Pendeen and Zennor, Land�s End reflects the magnificent moods of the Duchy, as it defiantly protects Cornwall from the worst storms that the Western Approaches can bring. 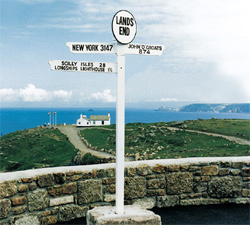 Land's End marks the end of the sea�s dominance. This is our Celtic heritage. The new look Land�s End includes the Land�s End Hotel, exhibition halls, play areas, a suspension bridge above the scene of many a shipwreck, and speciality shops with craftsmen at work. The Lost Labyrinth has been created to demonstrate the significance of the area with an experience featuring a stunning and original combination of lights and sound effects. Stroll along family-friendly paths above cliffs carved out by the waves of the mighty Atlantic Ocean. Find yourself in the company of soaring seabirds and, if youre lucky, the coasts resident basking sharks, seals and dolphins may put in an appearance. 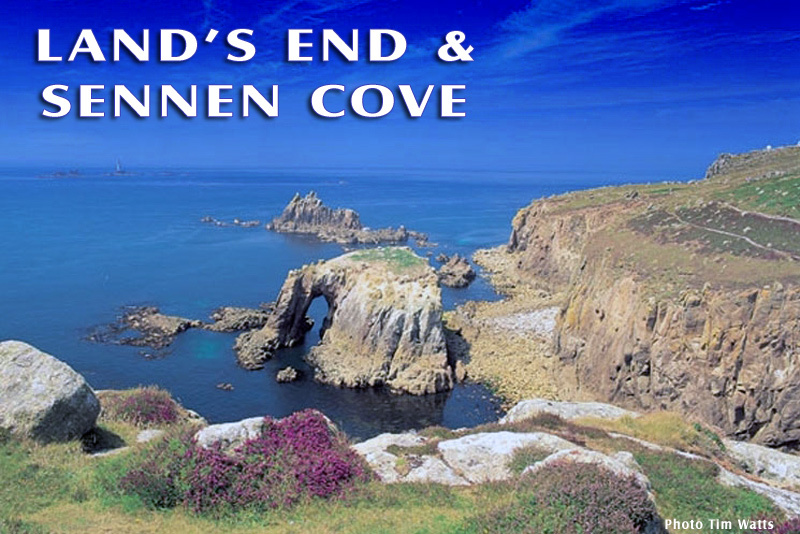 The entire natural clifftop adventure of Lands End is free of charge to enter - you pay only for car parking. This popular cove is tucked around the corner from Land�s End. 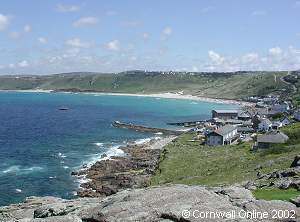 Sennen Cove has a very popular beach situated just a little way along the coast from Land's End, the most westerly point in mainland Britain. 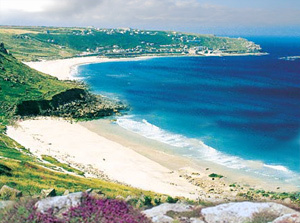 Sennen Cove boasts one of the finest stretches of sand in Cornwall. Whitesands Beach is a large crescent of sand that faces out onto Atlantic Ocean, so it experiences the full force of the Atlantic swell, making Whitesands Bay a popular spot for surfers. There is a well equipped lifeguard service in operation during the main holiday season when it is generally safe to swim. 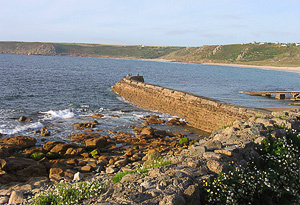 At the western edge of the beach, sheltering in the lee of the Pedn-men-du headland is the village and small harbour. 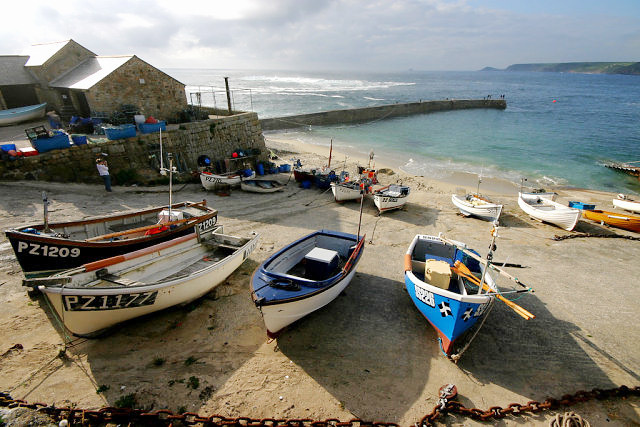 Sennen still retains much of the atmosphere of an old fishing village, with a small number of local fishing boats plying their trade from thee harbour. 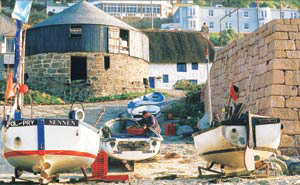 The small harbour has a working lifeboat station. N50º 04' 41.63" W5º 41' 52.68"
Sennen beach is a mile of fine sand stretching around to neighbouring Gwenver beach. This is a very popular beach for families in the main holiday season. 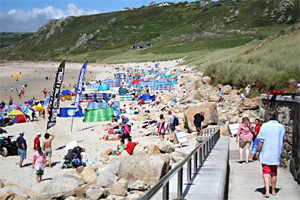 Access to Whitesands Beach is from the main car park in Sennen. There are toilets in the car park and you will find a few shops, surf shops , cafes and the "Old Success" public house, just a short walk away in the village centre. The "Beach Restaurant" is located on the beach, looking out over the Atlantic. The restaurant has a large terrace on which you can relax and enjoy stunning sunsets over this rugged and unspoilt bay. A short distance along the beach, there is a shallow valley with a small stream runs down to the sea. Sand dunes and marram grass offer shelter and it is generally a little quieter on the far side of the stream. At low tide the beach joins up with its neighbour, Gwenver beach, to provide over a mile of golden sand, so that even on the busiest day in summer, it is possible to find the ideal spot, to base the family. Surf lessons and board hire are available. Gwenver beach is sandy and around 150 metres long. This beach is best used at low tide, when it forms a large crescent beach with its neighbour. There is a lifeguard service present during the summer. Tel: 01736 810295. En-Suite B&B Stays in Penzance with Sea Views- sleeps 2. Tel: 01736 732699. En-Suite B&B Stays in Mousehole with Sea Views- sleeps 4. En-Suite B&B Stays in Mousehole with Sea Views- sleeps 2.